Neighbors, like family, are not chosen. Sometimes, though, you get lucky. In a section of the Old North Boulder neighborhood along Alpine Avenue, many lucky things are happening. It started several years ago after some traffic calming islands were installed at 14th and Alpine. Several neighbors thought they needed a little adornment. 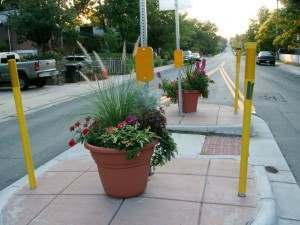 Some knocking on doors, a little planning and the serendipity that one neighbor is a professional gardener, and voila, the “Alpine Beautification Project” was launched and has now had four successful seasons. The flowers are kept alive with daily waterings from seven families taking charge one day per week. 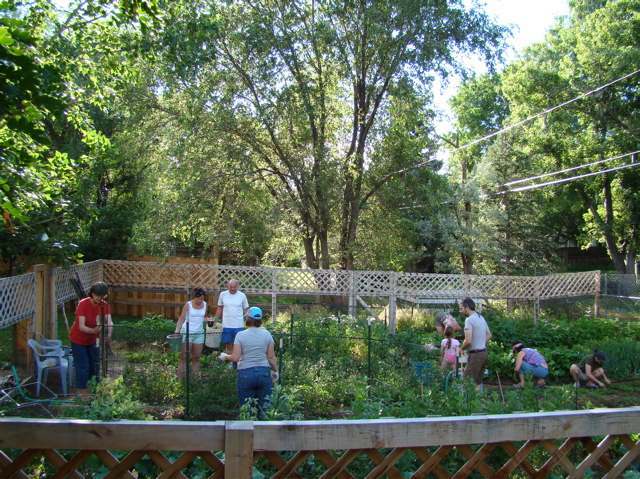 Having whet their appetite for community, the neighbors expanded their collective activity to a 1,800 square foot vegetable garden in one couple’s backyard. In a defining example of how the work of many can turn daunting tasks into quick accomplishments, seven yards of compost were moved and spread in the course of an hour and a half. The first season yielded enough beets, radishes, spinach, lettuce, chard, kale and zucchini to satisfy every family. Their latest endeavor takes advantage of the flower pot infrastructure. The Urban Hens pilot project is known as the North Boulder Egg Cooperative. Eight hens in a coop in one backyard are tended by seven families, each taking the eggs for that particular day. The chicken manure will be composted and used in the community vegetable garden. There is now talk about expanding a couple of beehives that are already residing in the neighborhood. A little community goes a long way. We don’t get to pick our neighbors, but these neighbors wouldn’t trade places with anyone.